Suunto Spartan Trainer is a beautifully designed GPS watch with optimal fit, ready to train how you want - whether you swim, cycle, hit the gym or run trails. Featuring convenient wrist HR measurement, the Trainer tracks your activity with calories and steps 24/7. Versatile sport and outdoor features make Spartan Trainer a natural partner as you push the city limits - and your own! Training with Spartan Trainer is simple and enjoyable. It uses GPS to measure speed, pace, distance and altitude. With 80 sport modes pre-installed to the watch, it is ready for nearly any sport, right out of the box. Sport-specific displays for running, cycling and swimming display relevant, real-time training data based on clear graphs. 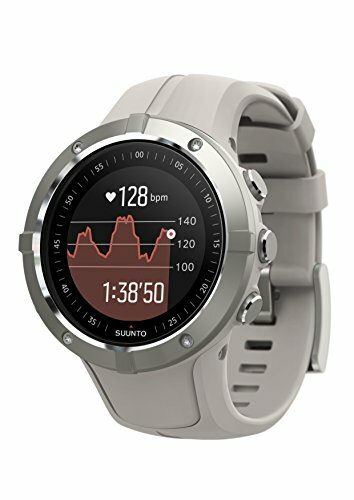 SUUNTO SPARTAN TRAINER WRIST HR: Suunto Spartan Trainer Wrist HR is a beautifully designed GPS watch with optimal fit, ready to train how you want - whether you swim, cycle, hit the gym or run trails. Featuring convenient wrist heart rate measurement, the Trainer tracks your activity, calories, and steps 24/7. Versatile sport and outdoor features make Spartan Trainer a natural partner as you push the city limits - and your own! EXPAND YOUR BOUNDARIES: True to Suunto's outdoor and adventure heritage, the Spartan Trainer comes with GPS route navigation and an automatic breadcrumb view, making it easy to discover new routes and places, yet ensuring you will always find your way back home. Join the Suunto Movescount service to create routes of your own, or browse new training locations and routes using heatmaps.